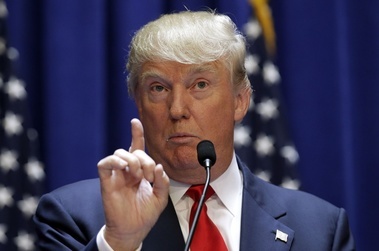 Spoof news: Who's Afraid Of Donald Trump? Who's afraid of Donald Trump? Seems like most of the folks in the Republican party. He recently was overheard to have said that Osama bin Laden was still alive and that he spoke to him. But Seal Team 6 finished him off and there was a burial at sea. Wrong. He was wearing Ferragamo shoes and a Gucci suit, and drinking a Margarita. You didn't see him? You're either owl blind or a Democrat. Yak, yak, yak! All that talk about a tall man walking up and down in his courtyard, and claims he was identified by his height using the length of his shadow from cameras perched on drones is just a lot of Obama-rama-drama baloney. The guy ain't dead! And he can do a real mean Gene Kelly tap dance! I'll give you all the evidence after I get into the White House. Republican candidates for president were asked about Mr. Trump's contention that Osama bin Laden was still alive, and as a group, (except for Carly Fiorina) they twiddled their thumbs, shrugged and said, "Who knows?" "Maybe?" "I have to go to the dentist." Ms. Fiorina was more committed. She called Osama bin Laden a messenger for peace, however because the Clinton administration failed to settle things with the Arab world, the towers came down. Marco Rubio is still reaching for water and credibility. Ted Cruz refuses to show his birth certificate. The guy is Canadian. Didn't you know? Not that there is anything wrong with being Canadian. It's just that foreigners can't run for the office of President of the United States. Remember President Obama's birth certificate issue? Jeb Bush is busy trying to win the nomination and popularity by doing belly-bumps. The free world is holding its collective breath in anticipation of a belly-bump between Jeb Bush and Vladimir Putin. Start stacking the pillows. Where belly-bumps are concern, a bump between Donald Trump and Vladimir Putin could send Putin into orbit. Rubio and Putin? A match. Cruz and Putin? Canadians don't do belly-bumps. They're originally British. Hillary Clinton and Putin? She'd flatten him.